Losing sleep affects your ability to concentrate. It can also put you in danger by increasing your chances of micro sleep, or periods of seconds or minutes when you fall asleep and do not realize it. These are particularly dangerous while driving or operating machinery that requires your full concentration. Even having these periods in a work or school environment can have negative effects. 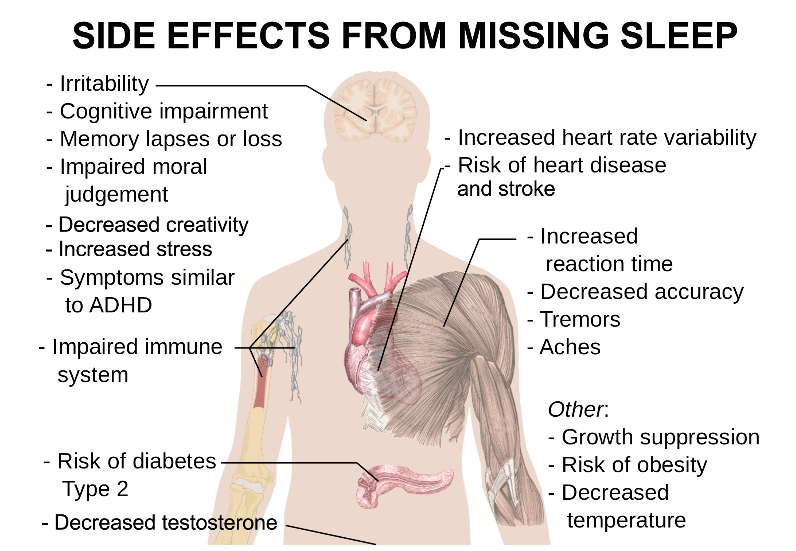 What is even more frightening are the long-term health effects that occur from regular lack of sleep. For those who experience insomnia and do not get a good night’s sleep the majority of the week or month, there are potential issues with your health that you should be concerned about. Talk to your doctor if you are not getting a good night’s sleep on a regular basis. If not, the following four diseases could affect you. Decision-making, creativity and mood are all affected when you are not getting enough sleep. A serious lack of sleep can lead to hallucinations. Depression is another concern for those who are not sleeping well. It is hard to find positive moods when your body is not functioning as it should. Chronic health issues like Heart Disease and High Blood Pressure are a result of lack of sleep. Not having enough sleep during a night can cause high blood pressure for the next day. A recurrence of this regularly can cause serious health issues. Fat storage is increased because insulin levels increase after eating when you do not get enough sleep. This can lead to Adult onset, or Type 2 Diabetes. A lack of sleep leads to overeating and not exercising. That in turn puts the individual at risk for obesity. This causes other issues with overall health. People who do not sleep well have their immediate future affected, with lack of concentration, little to no creativity and various other immediate issues. However, for those who struggle to get a full night’s sleep and do not give themselves the chance to catch up (not a long-term solution in itself), their health can really struggle as a result. Try to avoid having issues with insomnia. Consult a doctor if the issue persists beyond the occasional night or two a week.